Tonight at 7:00 pm central time for the weekly Energion Google Hangout on Air I’ll be moderating a panel of four authors. You can find the event information on our Google+ page. This event is not a debate about creation and evolution. While I vary the content from hangout to hangout, I avoid outright debates. Each of these authors accepts the theory of evolution but also believes that God is the creator. 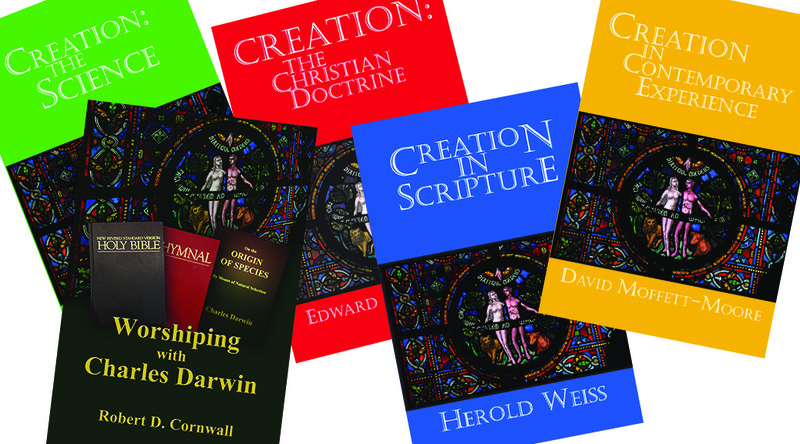 Dr. Herold Weiss started the series, which also includes Creation: The Christian Doctrine by Dr. Edward W. H. Vick, who is unavailable for this panel. What I have asked them to do for this panel is talk about how their beliefs about creation impact the way the read scripture, teach, worship, and live. The YouTube embed to view the event is below. If you want to ask questions of the panel using the Q&A App, you’ll need to sign into Google+. There should be a link on the YouTube viewer at the time the event starts for you to do so. I’d like to remember this idea of seeing the sacredness in every moment, rather than waiting for the special, sacred ones. I need to do it more often! I received two requests for help today. One was from a pastor overseas. He didn’t ask for money. He asked for prayer. I happen to know he needs money. But his most earnest desire is that Jody and I pray for him. I also got another request in the mail. It comes from an organization that does much good. They are raising money for a substantial building project that will make things more convenient, even much more convenient, for people in this country who are preparing to be missionaries. The amount is in the hundreds of thousands of dollars, maybe a thousand times the amount that would relieve the pastor’s need. But it’s not just this particular project that concerns me. It’s the proportion of our resources that go to providing for our comfort, for making it easier for us to do whatever we do, as opposed to the amount we put where it’s needed. I think of this when I see large recreation centers attached to churches that are empty most days of the week. Now I understand the need for places for sports and social interaction. In fact, a great deal of ministry can be carried out by providing a place for young people. But I know of more than one church that closes its facilities to outsiders. They want to avoid “those people” getting in there and perhaps damaging things or causing an increase in their insurance rates. I understand liability issues. I really do. But I don’t recall Jesus saying to do good to the least of these only when there was no risk. As a matter of fact, the gospels record that Jesus did it at a rather great risk. So many times we have facilities built that are just to entertain those who are already in the church. Again, I understand that people need rest and recreation. The church does need to provide for its members. But the ultimate purpose of providing for members is building the kingdom, and that means getting those members to go out and serve others. And so we come to church sanctuaries. In many churches the only use of the sanctuary is for a worship service on Sunday morning. That has to make it the most wasted piece of architecture around. One or two additional meetings a week may make it a little bit better, but it’s still underutilized space, space we pay a great deal of money to have. This isn’t the complaint of someone who doesn’t appreciate church architecture. I really like a majestic church sanctuary. I enjoy being in it. I enjoy sitting in the pews. If it has stained glass, it’s even better. A pipe organ? I’m in ecstasy. Just play it and let me look at the windows. But that’s the problem. I like it. It’s for me. The question is, just how much money should go to pipe organs and stained glass as opposed to feeding the hungry. I’m not saying we should put an end to all church music, or eliminate all church architecture, but what are the priorities? Where is the balance? In doing ministry in southern Mexico in the 1960s, my parents lived in a building with rough concrete floors (just try to sweep them), with a tin roof and walls that were not solid, so rain could blow in. My dad was a doctor (MD), and my mother a registered nurse. They could have had a great deal more, if they’d chosen to go to work in Canada (their home) or in the United States. But most of the time they didn’t, and when they did, they sought underserved areas. There were many things they wanted that they could not have. My own life is not without its problems, but I keep comparing it to theirs. What were their priorities? What are mine? I have had wonderful times of worship in fine church buildings, but I’ll never forget worshiping with a small Gypsy congregation in eastern Hungary on the first mission trip I led there. I was to speak. I had been a bit disoriented, because while I had been overseas before both as a child and young person with my parents and on mission trips, I had never been to a country where I couldn’t speak a word of the language. My Hungarian was such that the couple of words I had learned were potentially dangerous. I didn’t understand what people were saying. The room was small, too small for the number of people. The floor was concrete. The building was not beautiful. They had a small electric keyboard that would have been discarded had it been in one of our churches here, or probably even in a home as a child’s toy. Someone started playing it, and the people started singing. I didn’t know the words, but I felt the Spirit that was in that place. In fact, I have rarely felt the presence of the Spirit more than in that particular meeting. I disagree with both those viewpoints. Irrespective of my own beliefs (and I’ll get to those in a moment), I have met too many dedicated Christian believers whose faith is nurtured by Scripture and also accept evolutionary science to imagine that acceptance of evolution is necessarily the first step on the road to unbelief. I have also met too many intelligent and capable individuals who accept a young earth to believe that they are all ignorant or stupid. As a matter of principle, I never want to imagine someone is stupid because of their view on a single issue, nor do I want to think them immoral because of their view on one moral issue. Someone who is intelligent, competent, and functional, and yet believes something I find ridiculous, does not thereby become generally stupid. As an example, my dad was a doctor (MD), and an excellent one. Yet he believed in a young earth and a literal creation week his entire life. I’m not going to go down the route of believing that he was somehow less capable of carrying out his profession in a competent fashion, which he did all his life, because of one issue. There’s the family connection there, but I know a number of other people in similar situations. In spite of this, I am not arguing a middle of the road position. I have a firm position on creation and evolution. I was raised with young earth creationist literature. I devoured the literature written by George McCready Price and Frank Lewis Marsh, icons of my Seventh-day Adventist upbringing, as well as many others. I did not begin to doubt this view because of studying science. In fact, I changed my position through a study of Scripture. It all started when I wrote a college paper examining the text of the genealogies of Genesis 5 & 11 and looking at the resulting chronology. Archeology did enter into it, as I looked at the dating of events that would be required to match that chronology, but characteristics of the text itself first suggested that we did not have literal history there. Nothing I have studied since has changed my mind on that point. But I’ve written on this subject many times before. Just try typing “evolution” in the search box. I’m writing this because I’ve just sent a book off to the printer titled Worshiping with Charles Darwin. That’s a provocative title. Carol Everhart Roper designed a provocative cover to go with it. That was intentional. It’s not actually the most controversial book I’ve published, even on this topic, but I’ve focused on the controversy. That’s marketing, but it also comes from conviction. I look at this from two perspectives. First, as a Christian and a church member, I believe that this is a non-essential. That God is creator is an essential. How God created is not. I think we should have tolerance and respect in the church on this issue. But my belief in tolerance and respect does not mean that I don’t have a firm position on the issue myself. I believe that God is the creator of heaven and earth and that through the study of the world by the methods of the natural sciences we can learn how creation was accomplished and how the physical world functions. I believe we are in error both in theology and in science when we try to impose our theology on the findings of science. It’s bad theology because to claim that what we learn from the natural world is not reliable we make God a liar. It’s bad science because it imposes a conclusion prior to the data. But I also object to the word “evolutionist.” Evolution is not my philosophy. It is not my religion. It is not an article of my religious faith, though the fearless pursuit of accurate knowledge is. I am not an evolutionist any more than I am a gravitationist. I believe that gravity functions as science describes. I believe that evolution functions as science describes. I believe we will discover more about how each of these works. Neither gravity nor evolution is an object of my faith or trust. My trust in science is based on the method, a method that has proven functional repeatedly. It is not a matter of perfection either. Science will produce new results and alter previous understandings. But it has proven effective at correcting its own errors. Now people who believe what I do about evolutionary science have tended either to keep quiet in church or to simply say that we believe the Bible teaches that God is the creator and the how doesn’t matter. I don’t agree with these approaches. What I think we need to do is think about how the discoveries of natural science impact what we believe about God and how they change how we tell the story of God the creator. Genesis 1 & 2 told the story to the ancients. We can listen in to that story and learn theology and generate our own liturgy. But I think to tell the story as faithfully as it was told so long ago we need to tell the story of the creator in the light of what we know about cosmology and origins. Belief that God has used evolution as the means of diversifying life here on earth, and presumably elsewhere in the universe, is not a withdrawal from an area of faith. Rather, it is a new look at the expanding story of God and our knowledge and experience of God. We need to tell that story faithfully and vigorously. And this brings me back to the title of this recently released book. We could pretend that the discussion doesn’t matter, but that would not be faithful to the search for truth or to the integrity of the way we proclaim the gospel. I know of people for whom this issue has been a stumbling block. It’s time to talk about it openly. We’ve been arguing about it vigorously, but that’s not what I mean. We need to start looking at the implications and talking about how we tell the story of the gospel faithfully in the world God created and is creating. I think that is something worth celebrating. Bob Cornwall has taken up one part of that task. I hope the conversation continues to grow.